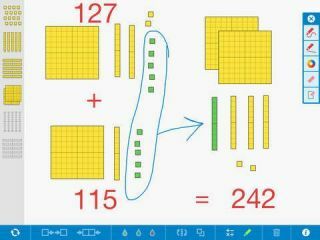 Class Tech Tips: Virtual Base 10 Blocks: Endless Manipulatives and Annotation! I’ve shared some of my favorite virtual tools for the iPad (here’s 23) and one fantastic free app I love is Number Pieces. This app simulates base ten blocks and lets students manipulate the pieces and annotate their screen. Students can take screenshots of their work and import the pictures into apps like Explain Everything or ShowMe. Then they can discuss what the steps they took to solve a problem and you can hear their explanation. It’s perfect for children learning place value, addition, and subtraction, and teachers who want their students to explain their work. Number Pieces is an iPad app but also available on web browsers making it a great choice for Chromebook classrooms. Not teaching place value? Check out my Common Core aligned lesson plans for using apps to teach: Symmetry, Fractions, Polygons, Graphing, and moreusing iPads with your students!